With Masters’ Nats scheduled during a month when I am not teaching, I set my sights on three races, targeting the time trial (TT). Why the TT? I like to be in control. Race strategy and tactics are not my strongest suit, so the TT made sense to me. If I adopted and adhered to an appropriate training plan and executed a race strategy based on my power data, I will have given 100%. If someone beats me, I can be disappointed but without regret. Chuck developed my training schedule, stressing progressively longer intervals at my “I hate this” zone. 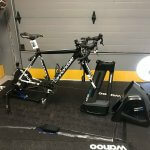 Wendy joined me on Tuesday evenings to spin inside and suffer with a computrainer workout modeled after the TT course. 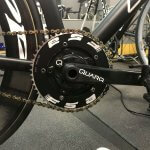 Chuck added ETap to improve ease of shifting on my TT bike. I avoided illness and cursed allergies. I gave up wine and Nutella to minimize empty calories. 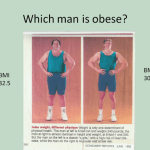 I went back to my old love – weightlifting during the winter months. Finally, departure day arrived. We loaded up the RV with 6 Scott bikes and a lot of Zipp wheels. NC bound. 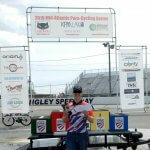 We stayed in High Point, about 30 minutes from the road and crit courses and an hour from the TT. We were joined by my teammate Christine and the rest of the Evo Men’s Masters’ team. Nine people, two dogs and a whole lot of carbon. 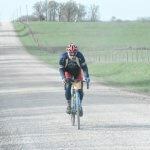 The day before the RR, Chuck, the Fuenti and I checked out the loop. Compared to MABRA courses, it was rather flat and reminded us of the old Murad RR in the Poolesville area. We would have the full road which was great for us and essential for the men’s fields which had more than 100. We arrived at the course early and set up our camp. I started my pre-race “Let’s get far too nervous” routine. Fill bottles, pin numbers, sit and stare into space trying to calm butterflies. Remembering to breathe. 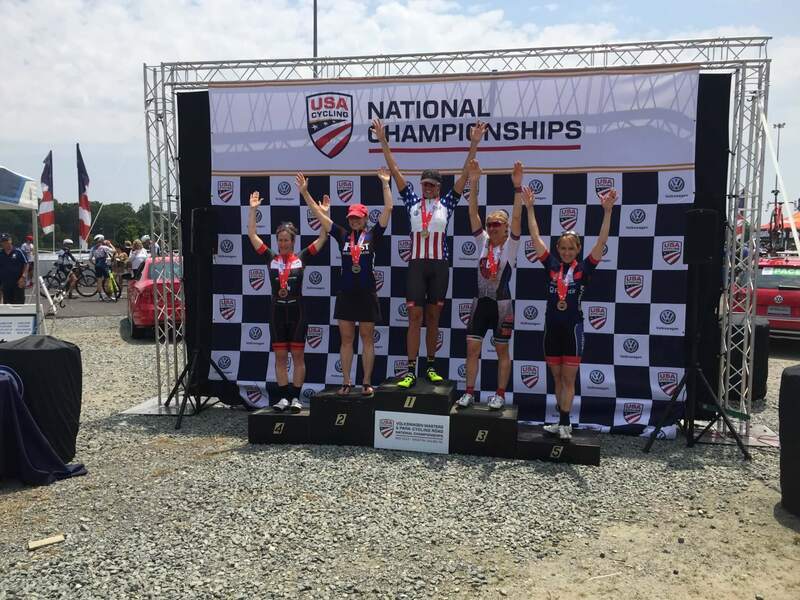 USAC combined our field with the 55-59 age group (still scored separately), bringing the total field size to almost 40. Four women represented MABRA, Janelle and Chris (Colavita) joined Christine and me. Janelle and I lined up side-by-side on the start line. Vic, Dave and Chuck were taking pics as we listened to the chief official give instructions. Given the palpitations of my heart, I could not really hear what was said. I just waited for the whistle and the start of my first National Championship race. Without any serious climbs, the course would not significantly narrow the pack. As we counted down the miles, some attacks did occur but were easily shut down. During the climb on the steepest hill on lap 2, I was riding toward the back of the pack on the right side edge when someone decided to pass on the non-existent pavement to my right. How we stayed upright, I am not sure but….I found myself sprinting to reattach. 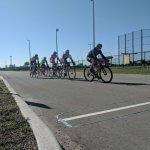 The field was not pedaling too fast and I quickly moved to the left side of the group, swearing off the edges of the road for the rest of the race. Midway through the second lap, I was pretty sure the race would come down to a sprint finish and given the bike handling I had seen, thought there might be a crash. As we passed the feed zone with about 3 miles to go, I was in the back of the pack. I needed to move up and followed Janelle’s wheel to the center, about second row. Riding by some was a bit chaotic and I wanted to stay on Janelle’s smooth wheel. She ended up trapped behind some riders who seemed to sit up as others started to sprint. Luckily, I moved to the dreaded right side as the finish came into view. I stood to sprint and was surprised to feel my quads spasm. I sat down for a second and stood again. Spasm. I crossed in the line in 8th place, somewhat happy. 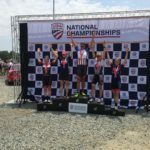 My first race in a national championship was over. 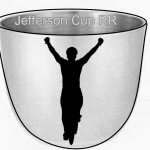 Lessons Learned: My failure in this race was primary hydration. It was warm, not hot and the cramping at the end of the race was avoidable. I did not sufficiently hydrate before the race. Although I was targeting the TT, I should have kept my head better in the game. The podium was possible for me and I wasted an opportunity. I wanted to skip the crit. I wanted my legs to be well-rested for the TT the next day. If Christine had not been in the race, I would have bailed. The course was short with 5 technical turns immediately after the start finish, then more open until the funnel to the finish. After the far from stellar bike handling skills demonstrated in the road race, I planned to jump at the whistle to get through those turns at the front of the group. We line up. More heart palpitations. The whistle blows and the women to my right, Kimberly Pettit (2nd in the RR), jumps and I chase her wheel. I look back and no one in behind me through the turns. She yells at me to pull through and we start working together….we have a break. Her cornering was far more aggressive than my inner-chicken liked but I was determined to stay on her wheel. I thought my heart would explode. At that moment I thought about my legs and the TT the next day. The TT went out the window. I was in a break in the national championships. I followed her lines through the technical turns and prayed I stayed rubber side down. Four riders bridged up to us. My heart and lungs were very thankful to have some help. We had about 14 seconds on the chasing group. As we approached the funnel into the start/finish line, I could see the chasing group enter the open section of the course. Each lap, my sighting was about the same place and our time gap stayed consistent. As we rotated on the front, I realized that two of the women were pulling off immediately and no amount of yelling or cajoling would get them to work. Kimberly was super strong. She told me to watch her for a signal to attack, for she feared we would get caught. Our lead over the chasers grew to 30 seconds. We were safe. With three to go, I heard Vic shout, “Think about the finish”. I knew I needed to jump early and planned to go as the course opens up and is more exposed to the wind. Bell lap. Kimberly jumped far earlier than anyone expected and we gave chase. I had one of the women who failed to do any work on my wheel and could not shake her. She nipped me at the line to put me in 5th place and on the podium. 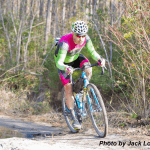 Christine’s work in the chasing group helped ensure an EVO podium! I was exhausted but very happy. Lessons Learned: Think about more than the last lap and be more aware of the person who I think is the greatest threat. After chatting with Kimberly after the race, she told me she thought I was the one to beat and wanted to go early to get away from me. I should have been more aware of her position during that last lap. After the crit, I was pooped. I spent the evening using my recovery legs, reading and hydrating. I would not make the same mistake as in the RR. As I warmed up for the TT, my power meter suggested great feats of glory were possible, with power readings in the 600+ range at an RPE of 4. Hmmm. Power meter recalibrated and battery changed, Chuck guided me to the start of the TT. I was 5th from the end to start. 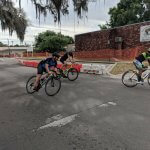 Despite the hard effort during the crit, my legs felt ok. The course is rolling – very little flat and the hills not super long. Mimi was a welcome face in the starting house as she counted me down to what I hoped would be another Evo podium. 5-4-3-2-1 and I was off. Although I still had some spiky power readings, I settled into my race strategy to climb the hills as quickly as I could (my comparative advantage) and maintain as much power as I could during the downhills (my comparative disadvantage). After the turnaround, the woman 30 seconds behind me passed me. I caught her on the next hill. She passed my on the downhill, both of us trying to avoid any chance of illegal drafting. The woman who started last (2 minutes behind me) passed me and I noticed the same pattern. I would gain time on the uphill and lose time on the downhill. I passed about 4 riders but never caught my 30 second person. I ended up 11th, about three minutes behind the women who won. When we looked at my power file, I hit my numbers. Perhaps I could have been a little faster. A minute max. Three minutes….no way. I fell short of my placement goal – on the podium, hopefully wearing gold. To Chuck – for perfecting the fine art of being both the girlfriend and the boyfriend, for believing in my cycling and being by my side every km of this journey. To Christine – for having my back during races and organizing Evo team headquarters, food and shelter.